In two words: Super Yum. The bars have a chewy lemon bottom with a sweet, creamy topping. The bars are more sweet than tart, so if you prefer a more tart flavor, be sure to read the recipe below for additions you can make. 1. Preheat oven to 350-f degrees. 2. For the crust, mix together the dry cake mix, butter, and 1 egg. Mix well. The mixture will be thick. Press into a greased 9×13 baking pan and set aside. 3. For the filling, beat cream cheese until smooth. Add the vanilla extract, eggs, and melted butter. (If you are using any zest, add it now) Mix together well and add powdered sugar. Mix until the powdered sugar is fully incorporated. 4. Spread filling over crust and bake for 38-42 minutes, until lightly brown and when gently shaken the center will only slightly jiggle. 5. Cool and cut into small bars. (I let my bars chill in the fridge for a bit before cutting) Cover and store leftovers in the fridge. Source: Adapted from Lynn's Kitchen. These look fantastic! 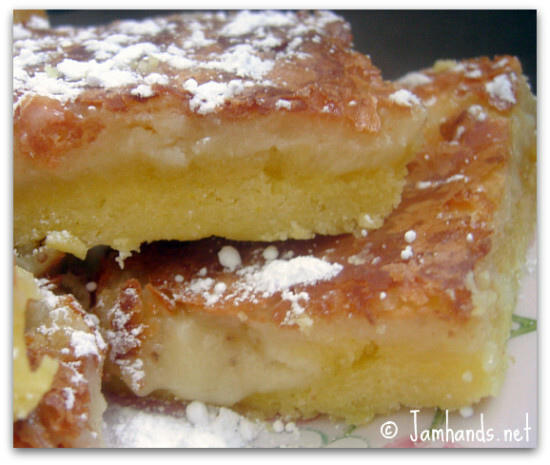 I love lemon bars and may just have to try this recipe! We love lemon bars at our house and these look delicious!! I am a new follower and would love a follow back at The Farm Girl Recipes. Thanks!! Thank you for the comments! I hope you enjoy them as much as I did. these look amazing! if these turn out for me, i might replace my current lemon bar recipe. thansk so much for sharing! Oh yes! Extra zest for me please! This looks so yummy! Thanks for posting this recipe - and thanks for adding this to Sweets This Week! Just. wow. I will be adding this to my list of things to make for next week! OKay! I am going to feature you on my blog. Because your recipes look so yummy.. So you can check my blog at for.the.luv.of.blogspot.com to see that I featured you!! I baked these today and served them to my family for dessert. They were a huge success!! Thanks for sharing the recipe. I made these for the Super Bowl and they were a hit! Bought all of my ingredients today to make them for Valentine's Day :) Thank you for the great recipe! It's heaven on the taste buds!